...could be the title of this illustration by Heinrich Kley. 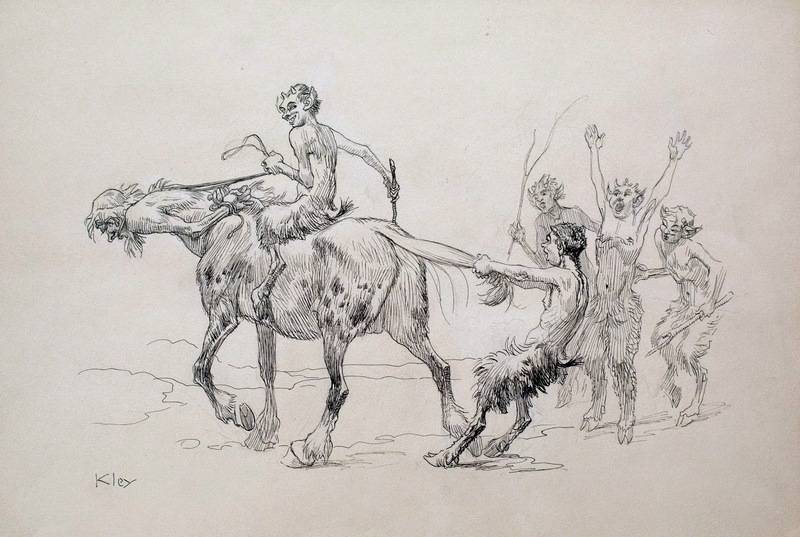 It's a little unsettling to see these Fauns treating the old Centaur so disrespectfully. Maybe the situation is part of a mythological story. What is wonderful to observe is Kley's incredible knowledge of anatomy, and how he applies it to fantastical creatures. Half human-half horse or half human-half goat, his depictions always make us believe that if those things really existed, that's exactly what they would look like. Most of Kley's fantasy drawings and paintings were produced about one hundred years ago, but they sure don't look dated. Particularly for artists who draw animation, his body of work remains an important source of inspiration and influence.